You'll see plenty of unusual pizzas on this blog, as I do quite a bit of experimenting with pizza. I love pizza. And I love Greek food. 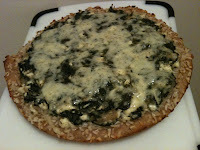 So, of course, when I decided to make a spanakopita (Greek spinach pie)-inspired pizza, I wanted to do it right. I thought about it for some time before actually making it. I started with some young spinach, which I'd sauteed with a few chopped shallots and some white wine a couple days ahead of time and then refrigerated. It is important that the spinach be cooked and cooled for this recipe. You'll see why. It's also important to drain it really, really well -- both when you cook it and again just before you make the pizza. Next, add crumbled feta cheese, dried dill weed and liquid egg whites to the mixture and stir it together. I know, it doesn't look very pretty. But don't worry. For my pizzas, I make my own crust. (I'll cover that in a post later on.) Perhaps you do, too. Or maybe you like pizza shells you can buy at the store ... or premade dough from the supermarket or your favorite pizza parlor. Whatever the case, the next step is to prepare your crust. I like flavored crusts. They just add a little something to the pizza. For this pizza, I pressed the crust into my cast-iron skillet, then spread a little olive oil around the outside edge before sprinkling on some dehydrated onions that I'd reconstituted. They were a nice complement to the flavors of the pizza without stealing the show, which is definitely the way it should be when doing a flavored crust. I'd love to hear other flavored-crust suggestions for this pizza, so comment away! make it "pizza-like" ... which means topping it with at least a little bit of cheese. I went with something that I thought would be the perfect complement to the ingredients while remaining true to the creamy, dill-y flavor of spanakopita that I love. I opted for Dill Havarti. It turned out to be a great decision. It worked perfectly -- melted nicely and tasted great. And it's easy to find in most stores these days. Once it was baked and cooled, the "spanakopizza" was ready to eat. And it was good. Very good, if I do say so myself. Doesn't it feel great to invent something that tastes awesome? · In a mixing bowl, combine spinach/shallots, feta, egg white and dill. · Place crust dough or pizza shell in a cast-iron skillet or pizza pan. · Spread spinach mixture on the crust. · Sprinkle shredded dill Havarti over spinach mixture. · Bake according to dough recipe/directions or pizza shell directions. · Transfer pizza to wire rack immediately after baking, and allow to cool for a few minutes. Doing this keeps the pizza from getting soggy on the bottom. · Transfer pizza to a cutting board; cut into slices using a pizza cutter. Looks terrific! I love spinach on pizza and in other Italian foods!